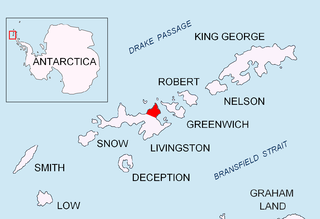 Williams Point on Livingston Island, the land discovered by William Smith on 19 February 1819. William Smith (c. 1790–1847)  was the English captain born in Blyth, Northumberland, who discovered the South Shetland Islands, an archipelago off the Graham Land in Antarctica. His discovery was the first ever made south of 60° south latitude, in the present Antarctic Treaty area. Earsdon Parish Records held at Woodhorn Museum show that William, eldest son of William and Mary Smith, was baptised at St. Cuthbert's Church on 10 October 1790. Smith had a younger brother, Thomas, and sister, Mary, and his father was a Joiner of Seaton Sluice. In the eighteenth century, boys would start their seven-year apprenticeship at sea at the age of fourteen. 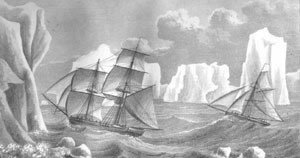 According to John Miers' account of the discovery, William Smith had undertaken his apprenticeship ‘in the Greenland whale-fishery’. During his life he worked with Richard Siddins, described by historian Ida Lee as "...perhaps the greatest traveler of them all, who gave so much information concerning early Fiji, and delighted to hold mission services on board his ship in Sydney Harbour." By 1811 he became part owner of a ship called The Williams which was then under construction in Blyth, Northumberland. The vessel was completed in 1813, measuring 215 tons burden and equipped with six 6-pounder carronades. In 1819, while sailing cargo on The Williams from Buenos Aires to Valparaíso, he sailed further south round Cape Horn in an attempt to catch the right winds. On 19 February 1819 he spotted the new land at 62° south latitude and 60° west longitude, but did not land on it. The naval authorities did not believe his discovery, but on a subsequent trip on 16 October he landed on the largest of the islands. He named the island King George Island and the archipelago South Shetland Islands in honour of the Shetland Islands which are to the north of Scotland. At the beginning of the following year, 1820, the Williams was chartered by the Royal Navy, and dispatched with Smith and Lieutenant Edward Bransfield on board to survey the newly discovered islands, discovering also the Antarctic Peninsula in the process. ^ a b "Smith Island". SCAR Composite Antarctic Gazetteer. Standing Committee on Antarctic Research. 8 September 1953. Retrieved 22 April 2015. ^ a b Jones (1982). Antarctica Observed: Who discovered the Antarctic continent?. Whitby: Caedmon. pp. 59, 62. ^ Miers, John (1820). "Account of the Discovery of New South Shetland, with observations on its importance in a Geographical, Commercial, and Political point of view". Edinburgh Philosophical Journal. 3: 370. ^ Lloyd's Register of Shipping. London: Marchant and Galabin. 1813. p. 753. Smith Island is 20 miles (32 km) long and 5 miles wide, lying 45 miles (72 km) west of Deception Island in the South Shetland Islands of the British Antarctic Territory. Surface area 148 square kilometres (57 sq mi). Varna Peninsula is a roughly rectangular predominantly ice-covered peninsula forming the northeast extremity of Livingston Island in the South Shetland Islands, Antarctica. It is bounded by Hero Bay to the northwest, by Moon Bay to the southeast, and by McFarlane Strait to the northeast. Desolation Island is one of the minor islands in the South Shetlands archipelago, Antarctica situated at the entrance to Hero Bay, Livingston Island. The island is V-shaped with its northern coast indented by Kozma Cove. Surface area 3.12 square kilometres (1.20 sq mi). Cape Sheffield is a cape forming the northwest extremity of Rugged Island in the South Shetland Islands, Antarctica. It was named for Captain James P. Sheffield, Master of the brig Hersilia of Stonington, Connecticut, in 1819–20 and 1820–21, the first American sealer known to have visited the South Shetland Islands. In 1819–20 he took 8,868 sealskins from headquarters at Rugged Island. Cape Smith is a cape forming the north end of Smith Island in the South Shetland Islands, Antarctica. The discovery of the South Shetland Islands was first reported in 1819 by Captain William Smith, for whom the cape is named. Barnard Point is a headland which marks the south-east side of the entrance to False Bay on the south side of Livingston Island in the South Shetland Islands, Antarctica. It is situated on Rozhen Peninsula, 1.5 km (1 mi) north-north-west of Botev Point and 6.6 km (4 mi) south-east of Miers Bluff. Williams Point is the point forming both the north extremity of Varna Peninsula and the northeast tip of Livingston Island in the South Shetland Islands, Antarctica. Separated from Zed Islands to the north by Iglika Passage. Herring Point is a point on the north coast of Rugged Island off the west coast of Byers Peninsula of Livingston Island in the South Shetland Islands, Antarctica forming the east side of the entrance to Hersilia Cove. Miers Bluff is the point forming the southwest extremity of Hurd Peninsula, the southeast side of the entrance to South Bay and the northwest side of the entrance to False Bay, on Livingston Island in the South Shetland Islands, Antarctica. The name "Elephant Point", given by Robert Fildes in 1820–22 to another feature, has been for a number of years applied in error to this bluff. It is now approved as originally intended and a new name has been substituted for the feature here described. Benson Point is the ice-free headland forming the southwest extremity of Rugged Island in the South Shetland Islands, Antarctica. It is a northwest entrance point for Morton Strait. The area was known to early 19th century sealers. 1.65 km (1.03 mi) east of Koshava Island, Zed Islands. The vicinity of Pyramid Island was visited on 19 February 1819 during the discovery of the South Shetlands by Captain William Smith in the British brig Williams, and later by early 19th century sealers. Sally Rocks is a small group of rocks trending southwestwards in South Bay just off the west coast of Hurd Peninsula, Livingston Island in the South Shetland Islands, Antarctica. Ivanov Beach is the mostly ice-free beach on Drake Passage stretching 5 km (3.1 mi) in southwest-northeast direction on the southeast coast of Barclay Bay in western Livingston Island, South Shetland Islands in Antarctica. It extends to Nedelya Point and Byers Peninsula on the southwest, Rowe Point and Etar Snowfield on the northeast, and the slopes of Rotch Dome on the southeast. Its ice-free area is ca. 144 hectares. The beach features Bilyar Point 1.7 km (1.1 mi) northeast of Nedelya Point, and a minor point 1.1 km (0.68 mi) southwest of Rowe Point. It is protected by shallows and numerous offshore rocks and islets, the largest of the latter being Cutler Stack off Nedelya Point.